In 2083, chocolate and coffee are illegal substances. Manhattan is rife with crime, and speakeasies and black market trade are rampant. Sixteen-year-old Anya Balanchine is caught up right in the middle of everything, not because she happens to be alive in this time, but because her family owns the famous Balanchine Chocolate company, and because her father, now dead, was one of the most notorious crime bosses in the city. Still, Anya tries her best to keep a low profile, since she doesn't want to bring attention to the fact that her bedridden elderly grandmother is their sole guardian, and her brother Leo is a bit mentally handicapped due to an accident when he was a boy. Unfortunately, when her ex-boyfriend is poisoned by chocolate that she gave him, she's all over the news and in a lot of trouble. It doesn't help that she starts a relationship with the district attorney's son. And all the while, she needs to maintain some sort of control of her brother and younger sister, Nattie, and keep them away from the influence of her mafia family. The feel of this book is a mixture of dystopia and old-school gangster, what with the prohibition on chocolate and coffee. I never really read anything about organized crime, but I found the way Anya handles things and the way her family operates fascinating. She is incredibly cool-headed, and mostly seems completely in control, even when she's going crazy inside. I truly admired her character, and I loved how she took all of her father's words to heart. She was always recounting some piece of wisdom her father imparted when he was alive, and I actually found them to be truthful and/or valuable. All of the characters are well-written, and I found myself caring for even the most dangerous characters. Except Gable; he's a jerkface. The dystopian society itself is not too far off from where we could be headed. There is a water problem, but one not large enough to have water rationed—yet. It's just very expensive, sort of like gasoline today. And the illegal substances of our time parallel very well with the illegal substances of this world. Organized crime developed around the chocolate and coffee industries because of their illegality, and people get a "high" off both of them, much like drugs and alcohol today. Interestingly, alcohol is widely available for all ages here. 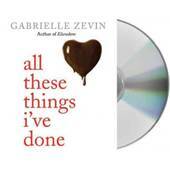 Zevin's language is, for lack of a better word, delicious. Something I want to sip slowly. I loved the atmosphere of her world. As far as the audio version goes, Ilyana Kadushin does an excellent job. She sounds spot-on for Anya, not too old or young. Her voice is soothing with no annoying quirks that I find happens often in audiobooks. And, she does a great Russian accent for Anya's older family members. It's very easy to tell the difference between each character's dialogue. I highly recommend the audio version of All These Things I've Done, and certainly recommend the book itself. I fully plan on reading the rest of the Birthright series when they are released. Disclosure: Macmillan sent me a copy of this audiobook in exchange for an honest review. This sounds excellent! There have been a few chocolate prohibition books/films, and I think that the concept works well for a young (or female ;) ) audience. I might see if I can grab a review copy of this one. Wow, this is the first audiobook we've reviewed? How is that possible? lol I review them on my blog all the time... I'll fix this. I mean, even more. Hey I reviewed this very same book today! I liked it! This sounds good and I am getting into audiobooks again. Thanks for the review!